A Day after Ugadi, a mutton shop in Bengaluru's Byatarayanapura sold 600 kg meat! Following the Hindu lunar new year, Kannadigas celebrate Hosa Todaku, when they consume non-vegetarian food. Mutton is a delicacy relished on this day and every year, meat shops in the city witness queues of people waiting to buy goat meat. This year, Papanna Mutton Shop witnessed long lines of people with some coming as early as 2 am. 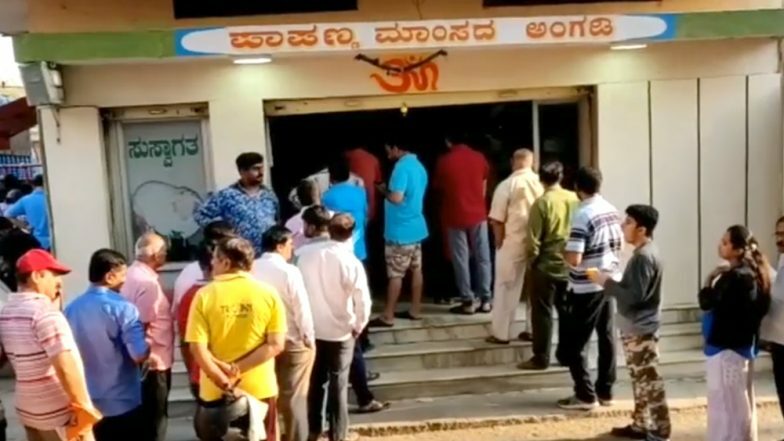 And now video of people patiently waiting to buy meat in Bengaluru has gone viral on social media. Shop owner Santosh told The Times of India that people started coming at 2 am which continued till 2 pm. At 9 am, around 300 people were seen waiting in long queues to buy mutton. A local captured the incident and posted the video on social media following which it went viral. This shop in Bengaluru is quite famous as it lets people choose a particular part of the meat they want to buy. Hence, customers don't mind paying a higher price and patiently wait in the queue for their turn. Mutton Biryani Served As Prasad in Tamil Nadu’s Muniyandi Temple During Mega Feast. While the rest of the mutton shops sell mutton for Rs 540 to Rs 560 per kg, Pappanna Mutton Shop charges. Santosh said his grandfather Papanna started selling mutton and his continued the business. He told TOI, "My father P Manikyam inherited the business from his father and now I am taking it forward." Talking about letting customers choose the particular part of mutton they want, he said, "Many shops do not provide such an option. We buy sheep from Magadi, Kanakapura and Ramanagara."